Stanhoe at Stanhoe Village and gardens01553 763044work VillageStanhoe is a small village around 11 miles east of Hunstanton. In the middle of the village is a large duck pond, otherwise known as the Pit. Many of the houses are built from traditional Norfolk materials of flint, chalk, and brick, roofed with curved red tiles. There are several fine large houses, including Stanhoe Hall. The village has a public house The Duck Inn and a working pottery. Stanhoe has been a farming community since the Romans times. The name Stanhoe derived from the Saxon name (“stony hill”). The church of All Saints appears to have been originally built in the late thirteenth century. It was refurbished in the Victorian period and has fine stained glass from the late 19th and early 20th century. 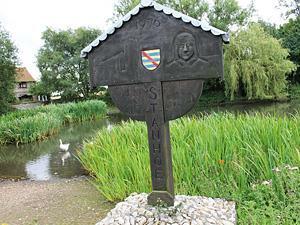 The village sign features Sir Hervey de Stanhoe who was High Sheriff of Norfolk and Suffolk in 1260. Stanhoe is a small village around 11 miles east of Hunstanton. In the middle of the village is a large duck pond, otherwise known as the Pit. Many of the houses are built from traditional Norfolk materials of flint, chalk, and brick, roofed with curved red tiles. There are several fine large houses, including Stanhoe Hall. The village has a public house The Duck Inn and a working pottery. The village is well located on the B1155 between Docking and Burnham Market, ideal for exploring the coast and countryside including Creake Abbey at North Creake just 3 ½ miles away.